A conversation with Ruth Zalph of the Raging Grannies about her decades of activism and why she's getting arrested to stop the tax bill and fight for health care. 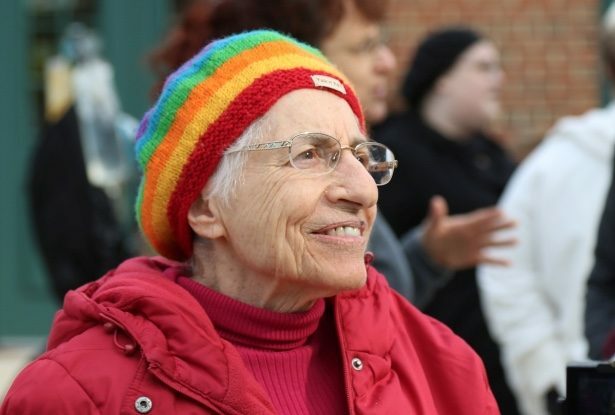 In recent weeks, 87-year-old Ruth Zalph has been repeatedly arrested in Washington, D.C. for protesting the GOP tax bill and advocating for health care coverage in Washington, D.C. Known as “Raging Granny Ruth,” Zalph is a founder and member of the North Carolina chapter of the Raging Grannies, a group that uses song and street theater to advocate for justice and equality, particularly in the realm of voting rights and fair political representation. Before the Raging Grannies, Zalph already had an extensive history of activism and community organizing, including countless arrests protesting nuclear weapons during the Cold War, as well as leading a portion of the 860-mile NAACP Journey for Justice march in 2015. She has also conducted many actions as part of the Delray Citizens for Social Responsibility and the Florida Coalition for Peace and Justice. I recently met up with Zalph at a sit-in against the tax bill, where she joined disability rights activists and faith leaders in civil disobedience actions on Capitol Hill. She told me about her early anti-nuclear activism, her current involvement in the movement for health care and political equality, and how the Raging Grannies have evolved over the years. You started out as an activist protesting nuclear energy and nuclear proliferation. Why was the anti-nuclear movement so important to you? I traveled to Kazakhstan and Ukraine when they were part of the Soviet Union. In Ukraine, I interviewed a dying victim from the Chernobyl disaster. The government didn’t have to answer to them. Those facilities were thought to be fail safe. So, for example, when Duke Energy announced plans to store nuclear fuel waste at the Shearon Harris plant in 2000, I went with a group of people to their offices to demand a public hearing. We wanted to deliver a letter to the CEO, but weren’t permitted. So we stood downstairs [and refused to leave]. They arrested us for trespassing, and the case went all the way up to the North Carolina Supreme Court. I read a testimony in court, and I explained that the nuclear waste storage project posed a great safety hazard to the general public. So, our actions were done for the greater good. I told the court room that I was there to represent the innocent ones, and that I was willing to break the laws of man to follow a higher power. What is one memorable moment you can recall from your earlier acts of civil disobedience? When did you become a Raging Granny, and could you tell me more about the group? We are a disorganization. I was one of the people who started the North Carolina chapter 20 years ago. The Raging Grannies was started by a group of middle-aged women in British Columbia, Canada, when American nuclear submarines were stationed in their port. The group is made up of middle-aged women, and they started going out with signs telling the United States: “Take your nuclear submarines out of here!” But nobody paid any attention to them, so they decided they needed to do something more dramatic. It was useless, they were doing this every other week. So they decided, “Okay, we’ve got to sing some songs and do a little street theater, and maybe people will pay attention.” And they were right! So they dressed as they thought grandmothers would dress: They put on hats with big flowers and buttons, and they got out there and sang. Well, lo and behold, the press came, the photographers took pictures and people paid attention to them. And this started spreading. There are now 99 gaggles of grannies around the country, and there are a few in other countries as well. Everyone can help write songs, everyone is encouraged to be a leader at an action. We meet every month, and we try to encourage people to join in decision-making. Every two years, all the Raging Grannies from Canada and the United States get together for an “un-convention.” Our beliefs are nonviolence, justice for all people, fair voting and fair representation, immigrant rights and workers rights, both at the state and national levels. We do not endorse candidates, we focus on issues. So we will favor women’s rights and equal pay, we will favor the right for a woman to decide what is good for herself and her family, but we’re not endorsing a person. When they have a tax bill that’s going to take away children’s healthcare, that is not fair. How have you been involved with the current protests against the GOP tax bill in Washington? I’ve been arrested three times in Washington, D.C. since September for protesting this horribly insidious tax bill with its implications for health care. I participated in the Moral Mondays demonstrations in North Carolina, led by Rev. William J. Barber. And I realized at one point that I am a white woman with privilege, privileges that not every woman gets. Therefore, it was incumbent upon me to try to work to see every woman — white, black, gay, straight, transgender — have the same rights as me. Our country is just such a racist country. It started with taking away land from the native peoples and they are still suffering today. The U.S. government has broken so many treaties. So, as an individual, I say our system stinks. But I speak for myself on that. I joined the NAACP, and I was part of America’s Journey for Justice in 2015, where people started walking from Selma, Alabama to Washington, D.C. Rev. Barber was there, and he said, “I’ve got this problem with my back, at one time they never thought I’d be able to walk or stand. And I can stand, and I can walk with a little help. But I can’t walk this march.” So, I said, “I’ll walk for you.” Well, that was that, I opened my mouth! I partnered with the flag-bearer, an African American man in his late 50s [who called himself Middle Passage]. He had had two heart transplants, and he and I led the march. I walked a hundred miles. He collapsed two days before we got to Washington, and he passed away, which was a great loss. Now it’s growing. There are hundreds of organizations that participate. We do an awful lot of letting our legislators know what’s important to us. One thing is labor, fair salaries, the Fight for 15 is part of it, and the ability to have a union, fair voting. Have the Raging Grannies taken on a bigger role since Donald Trump was elected? We certainly have a lot more to sing about! We have just so many things that are important to us, to maintain our freedom, women’s rights. We sing for the planet about global warming, Duke Energy’s coal ash and fracking, the Atlantic Coast pipeline, the Environmental Protection Agency. Sometimes we go to public hearings, and you have to sign your name if you’d like to speak. I’ve signed my name and gotten up and sang. One time, we were at a hearing and they said, “You will not be allowed to sing,” which is outrageous. It must be hard to sustain your energy in spite of the frustrations and tragedies you have witnessed. How do you keep from feeling cynical? I think about the people who have engaged in civil disobedience in Washington, D.C. They are people who have disabilities from birth. They have open ports in their bodies, feeding ports and a port for their heart, but they are working, going to school. There are people with ALS, people with Down’s Syndrome, who come out to Washington and they really give me inspiration. These people stand out there and say, “You are trying to take away my healthcare, you’re trying to kill me! Kill the bill, don’t kill me!” You’ll be hearing that chant a lot from us now. What advice can you give to those who are just getting started with civil disobedience? And resist! Don’t let them scare you off. Corporations like Duke Energy are always trying to do whatever they can to put more money in their pockets. If you don’t keep at it, they’re going to get their way all the time. You’ve gotta fight back, fight back, fight back. This is great inspiration. And it would be great to follow up with other organized forms of organized form of working for justice: elections, accountability sessions, raising money, getting people to run for office, setting up permanent progressive electoral organizations. I have some guidance on this stuff in my book, Building Powerful Community Organizations, by Michael Jacoby Brown, not a complicated guide. I know Ruth Zalph. I used to call here Zalph from Wilpf. She has been one of the shining lights in the North Carolina sky for years. Clone yourself, Ruth! <figure id="attachment_45233" aria-describedby="caption-attachment-45233" class="wp-caption alignnone"><img class="size-large wp-image-45233" src="https://wagingnonviolence.org/wp-content/uploads/2017/12/6U8A7257-615x415.jpeg" alt="" width="615" height="415" srcset="https://wagingnonviolence.org/wp-content/uploads/2017/12/6U8A7257.jpeg 615w, https://wagingnonviolence.org/wp-content/uploads/2017/12/6U8A7257-180x120.jpeg 180w, https://wagingnonviolence.org/wp-content/uploads/2017/12/6U8A7257-300x202.jpeg 300w" sizes="(max-width: 615px) 100vw, 615px" /><figcaption id="caption-attachment-45233" class="wp-caption-text">Ruth Zalph at a tax bill protest on Capitol Hill on December 5. (WNV/T.W. 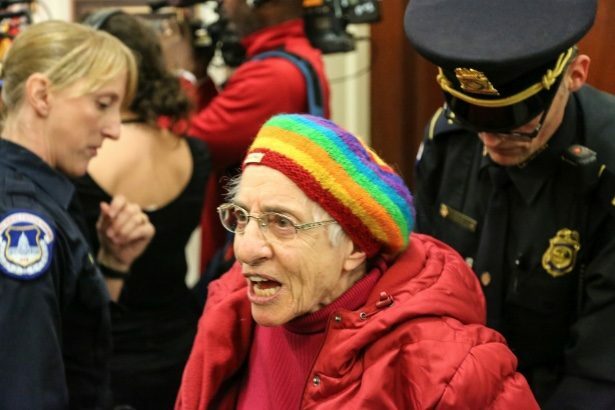 Collins)</figcaption></figure> <p>In recent weeks, 87-year-old Ruth Zalph has been repeatedly arrested in Washington, D.C. for protesting the GOP tax bill and advocating for health care coverage in Washington, D.C. Known as “Raging Granny Ruth,” Zalph is a founder and member of the North Carolina chapter of the Raging Grannies, a group that uses song and street theater to advocate for justice and equality, particularly in the realm of voting rights and fair political representation.</p> <p>Before the Raging Grannies, Zalph already had an extensive history of activism and community organizing, including countless arrests protesting nuclear weapons during the Cold War, as well as leading a portion of the 860-mile NAACP Journey for Justice march in 2015. 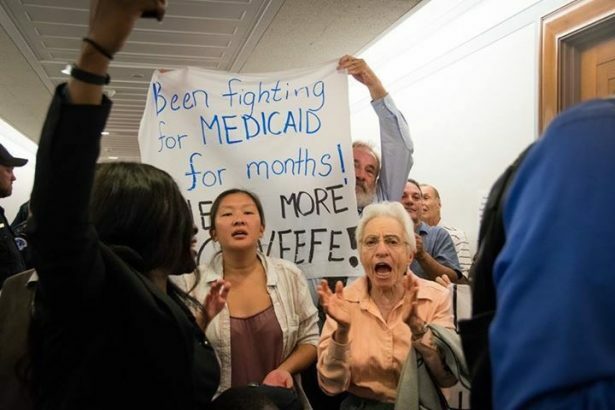 She has also conducted many actions as part of the Delray Citizens for Social Responsibility and the Florida Coalition for Peace and Justice.</p> <p>I recently met up with Zalph at a sit-in against the tax bill, where she joined disability rights activists and faith leaders in civil disobedience actions on Capitol Hill. She told me about her early anti-nuclear activism, her current involvement in the movement for health care and political equality, and how the Raging Grannies have evolved over the years.</p> <p><strong>You started out as an activist protesting nuclear energy and nuclear proliferation. Why was the anti-nuclear movement so important to you?